Want to join in the discussion? You must register with the site first! Registration is required to prevent trolling and spam in the comments section. Having a goal in life gives you a reason to get out of bed in the morning. Finding a satisfying goal worth working toward is what gives our life meaning and purpose. A lot of people struggle with the whole, living a life full of meaning and purpose. I haven’t. And as I have gotten older I think I know why. I am a Humanist. My life is infused with meaning and purpose. The goal of a Humanist is to life a life of personal fulfillment that aspires to the greater good of humanity. That’s my primary goal. Live life fully. Love other people. Leave the world a better place. #Humanism. This is my goal above my goals. Whatever I am working on or doing, it is with an eye on living life fully, loving other people and leaving the world a better place. Live. Love. Leave. Lots of people have this as their goal. What they struggle with is how and what. What exactly should they be doing and how exactly does one go about living? The mistake people make is they overthink this. They are looking for the one true purpose that will bring their life meaning. But there is no one true purpose. Your purpose is whatever you decide it will be. There is no magic force that wants you to do one thing and one thing only. Whatever you can do, you should. It really is that simple. Most of us are destined to oblivion. We are not going to be famous and we are not going to dramatically change the world. But we can have a positive impact on the people we know personally. We can help make a little bit of progress. We can make things better in our little corner of the world. This is the goal and purpose equivalent of think globally act locally. If you are stuck thinking you have to do something bit and splashy, you a) are letting you ego get in the way of getting things done, and b) you aren’t getting anything done because you have no focus. You don’t have to be all things to everyone to have an impact. You just have to decide what matters to you, however small that is, and make it better. Imagine if everyone lived life this way. They did what they could do and corrected the injustices of the world directly in front of themselves. Little by little, things would improve. And that’s actually how things do improve. There isn’t some magical moment where things were suddenly different. Things became different through millions of minor adjustments that are made by individuals. It is only after the fact we even notice it happened. If you don’t know what you are supposed to be doing with your life, don’t fret. Figure out your big overarching goal behind your goal. How do you want to live and what sort of legacy do you want to leave on the individuals who knew you personally? Choose something to do that you think will help you accomplish that. Then. Do it. 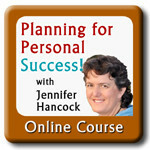 To learn more about how to redefine how you think of success and how to more effectively accomplish your goals through strategic planning – take the course – planning for personal success.